September 6 – What would the value of players in the early years of the Premier League look like if they were playing today? Andriy Shevchenko, who cost just over £29 million when he transferred to Chelsea in 2006, would likely cost over £144 million. Research by credit report provider TotallyMoney has taken the average transfer values of players since the English Premier League began in 1992, and compared the increase in transfer costs over time. 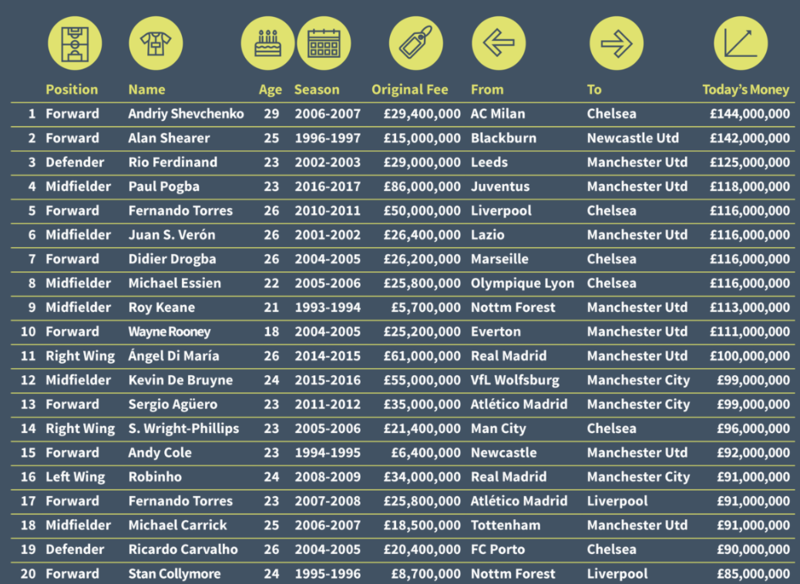 While Shevchenko tops the list, Rio Ferdinand takes second place, whose value of £29 million when he transferred to Manchester United in 2002 would today be just over £125 million. Alan Shearer takes third place when he transferred to Newcastle in 1996. The club paid close to £13 million – a world record at the time – a value that would equate to just over £121 million today on the TotallyMoney inflation index. TotallyMoney has created an interactive tool showing all the transfer costs since 1992, when the Premier Leaague launched. For more information and for the complete list of players, go to https://www.totallymoney.com/content/transfer-index/.